UPDATE- Thunder! I expected this to be further north, but here we are. High pressure is in control to our north which has lowered temperatures considerably from just yesterday. A cold front dropped south of Southern New England yesterday afternoon/evening. You probably noticed the wind increase if you had all your windows open like yours truly. Mother Nature is going to have a hard time making up her mind in regards to what type of weather she wants us to have over the next 48-72 hours. Let's try to time it out. Temperatures as of 10 AM are in the low to mid 50's. Temperatures will get into the low to mid 60's. Our first chance of rain showers will be in the early afternoon hours today, mainly north of the Pike. 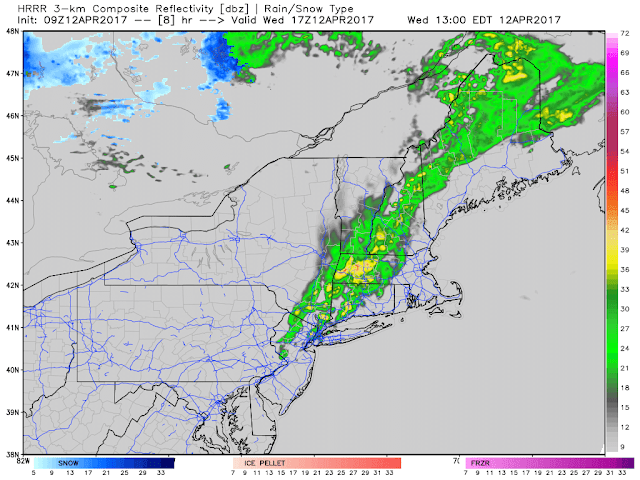 Some of that convection in New York will reach MA/NH/VT between 1-3 PM. The visible satellite shows clear skies right now, but lots of clouds to our west. Notice the well-defined spin in Oklahoma and Kansas? That is the center of a massive storm system that has brought flooding and severe weather to the Central US. Unfortunately, this storm has blood on its hands as the storm has claimed 7 lives and injured hundreds more. Here is the where the storm will be at 2 PM. As the storm system slowly moves east tonight, it will help lift the frontal boundary to our south back north again. This will touch off several showers after midnight. These should be gone by 4 AM. Monday morning and early afternoon look nice, but this won't last long. Temperatures will depend on just how far north the warm lifts. 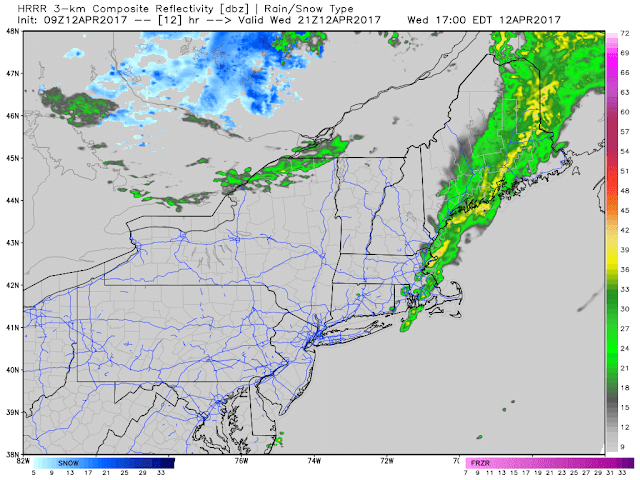 The National Weather Service likes the front reaching the Merrimack Valley. Showers will again be possible after 4 PM as the Central US storm system gets closer to our neighborhood. We will get most of our rain from this system Monday night into early Tuesday morning. The precipitation will be over and done with by the AM commute. Some drizzle and light showers will be possible throughout the day as the cold front lags behind the precipitation. Winds will be gusty Monday night through Tuesday afternoon. Gusts 30-40 MPH will be possible. The sun is expected to come out later Tuesday afternoon. Temperatures will rise into the 70's when that happens. It's a mild morning out there with temperatures running in the mid to upper 50's already. 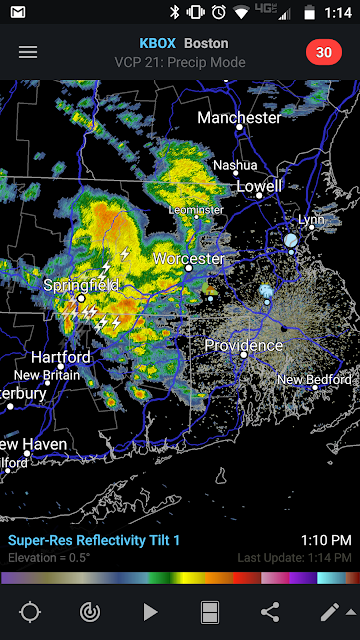 There are a few showers and thunderstorms moving across Southern New England (SNE) right now. The cell moving along the CT/RI coastline has produced several lightning strikes. The bulk of the activity looks to be in CT, RI, and SE MA including the Cape and Islands. Here is the future radar from 7 AM to noon time. Just looking at the current radar I think this is overdone a bit. I'm not sure the extent will reach Boston. A cold front to our west is responsible for the increase in temperature and moisture this AM. The front is weak and it will fall apart as it reaches the Atlantic. The skies will clear by the late morning across interior SNE and for most of the region away from the immediate coast by 2 PM. 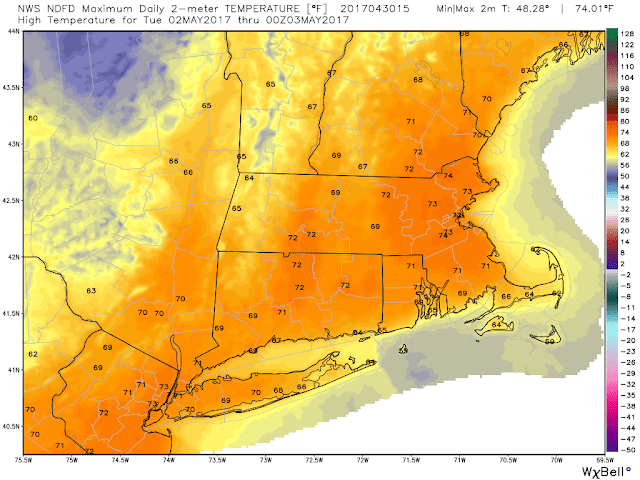 This will allow for temperatures to reach the mid to upper 70's. A few locations in the traditionally warmer spots will reach 80. My money is on Bedford, Westfield, or Lawrence. The air mass behind this "cold front" is nothing of the sort. Tonight temperatures will only fall to around 60. Dew points will be on the rise after midnight. 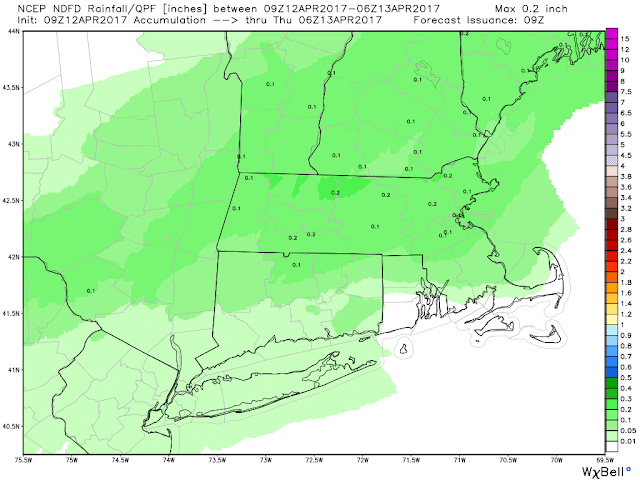 If you have early Saturday AM plans be prepared for a batch of rain tomorrow. The timing would be between 6-11 AM. The greatest threat is north of the Pike, but a few showers will cross the southern zones as well. The is a low threat of lightning with these showers. Once high-pressure nudges this system offshore it will a very nice Saturday PM. Max temperatures will be in the mid to upper 70's, Winds will gust 20-25 mph at times. High pressure will keep the front south of the region on Sunday. Expect seasonable weather with temperatures in the low to mid 60's. The cool wind out of the north and a cool upper atmosphere may produce a spot shower or two Sunday PM, but should be partly cloudy for the most part. Enjoy the weekend, talk to you all soon. April 2017 has been very beneficial to residents of Southern New England. Winter precipitation has been near normal the past few years and we still entered into a moderate to severe drought last summer as the momentum was unable to hold as we approached the warm season. So far so good as we should expect some wonderful flowers next months thanks to all these April showers. Just yesterday 0.5 to 2.0" of rain fell east of the Connecticut River. This area has been the bulls-eye for precipitation in April. Some communities in Essex, Plymouth, and Bristol counties are over 6" of rain for the month. In Providence, the 5.99" (and counting) is good for a top 10 spot on the "wettest April" lists. What a difference longitude makes; Hartford is in the middle of the pack for the month with rainfall just slightly above average. The rain is not done either. There is more to come from this system and perhaps a bit more Friday. Here is the Northeast regional radar loop from the NWS. Notice the bands still rotating in off the Atlantic. The low is currently just off the NJ coast. It won't move much today. Here is where the low is forecast to be at 8 PM today. That said the forcing is lessening as the storm decays. Rain will become less organized and much more showery in nature. Here is the 18-hour radar loop beginning at 8 AM. 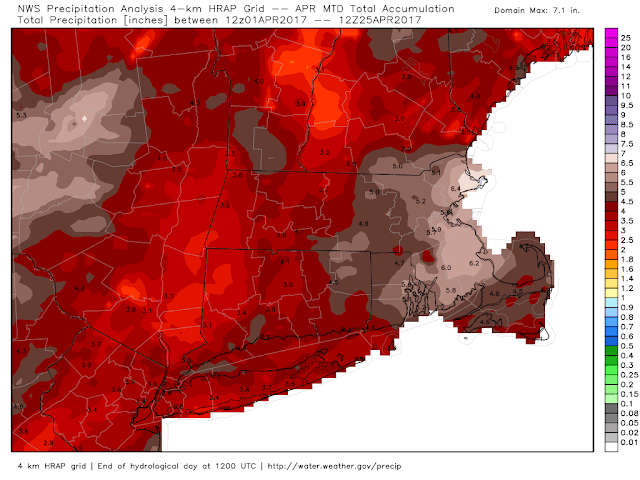 Another 0.25" to as much as 0.5" of rain is possible across Eastern MA, specifically Bristol and Plymouth counties. Temperatures today will climb into the upper 50's/low 60's. The air will have a bit of a humid kick to it, especially along the South Coast thanks to tropical connections this storm has made along its journey. The east wind will be light for much of the interior but it will gust 20-30 mph across SE MA. The easterly fetch has prompted the NWS to issue a *Coastal Flood Statement* for the AM high tide. 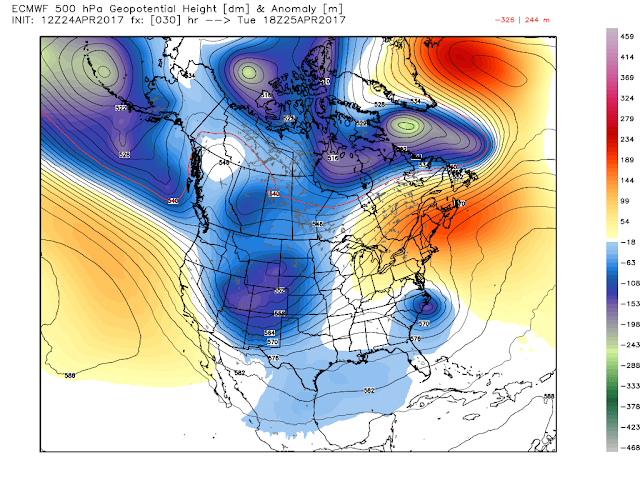 Thanks to upper level blocking the low will slowly dissipate near the Southern New England coast. This will keep chances of rain/drizzle up for Coastal SNE on Thursday. 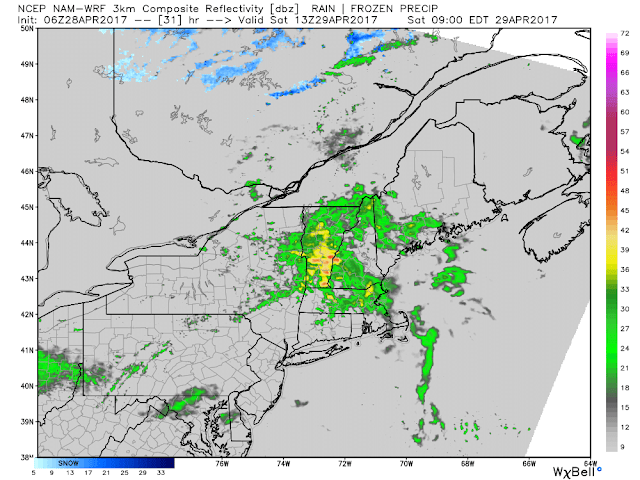 The low-level fog/drizzle will likely reach Worcester County for at least the morning hours tomorrow. Some sunshine is forecast for tomorrow afternoon which will allow for max temps in the upper 60's/low 70's. The next chance of precipitation for everyone will be Friday when a cold front tries to cross the region. The front will slow and weaken to our west, but the resulting SW flow will bring warmth and a chance of thunderstorms. 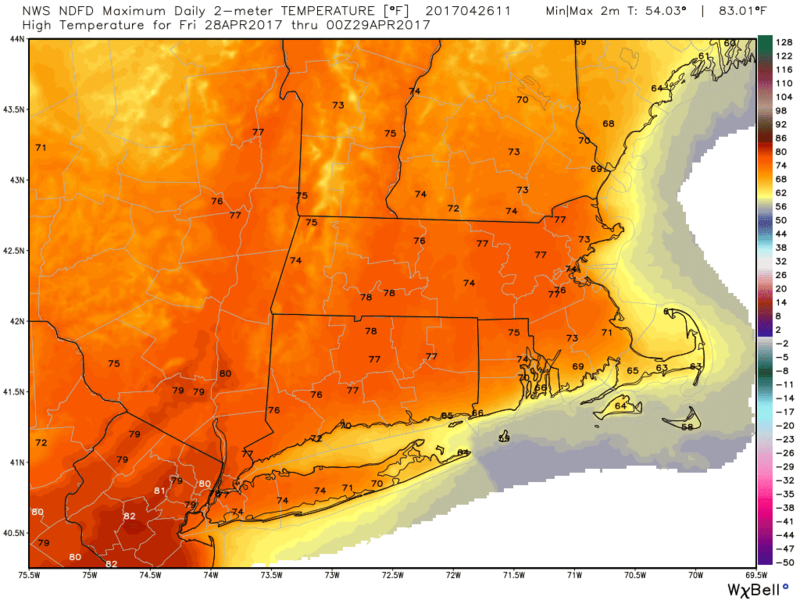 Max temps will be in the mid to upper 70's (less under cloud cover). 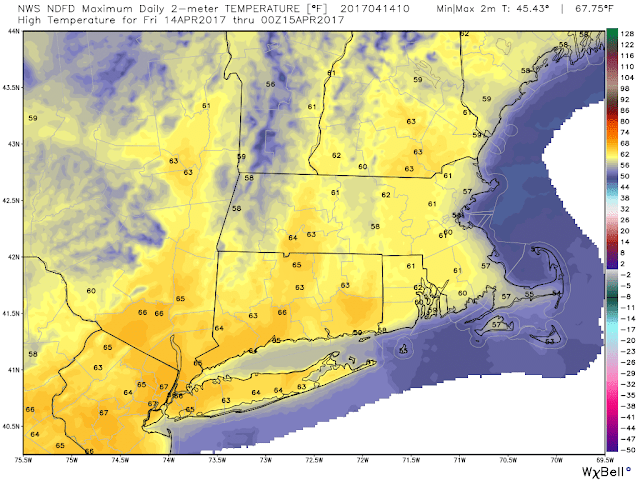 Saturday looks great, Sunday looks a lot cooler thanks to a front backing south keeping New England on the cool side of the boundary. This happens often in April/May. More on the weekend tomorrow. It's been a little bit since my last blog post but now that the mid-spring break is over full-time coverage will resume. A coastal low will slowly lift north Tuesday bringing periods of rain, wind, and minor coastal flooding through Wednesday AM. Behind the low temperatures will soar into the low to mid 70's, peaking near 80 on Sunday. On satellite, we see a large storm just off the South Atlantic Coast. It has a tropical connection that stretches into the Caribbean Sea. There is a lot of rain falling in the Carolina's this afternoon. Flash and River Flood watches and warnings have been posted throughout this region. This will slowly track to the north thanks to high pressure protecting the northeast. Here is the surface chart for 8 PM tonight. This high will work with a building ridge in the Northwest Atlantic to keep this low around longer than it is welcome. Most ocean storms quickly race to the Atlantic Canada and into the Graveyard of the North Atlantic. Just like humans, weather systems also have to deal with traffic. This NW Atlantic "block" literally slows down the entire jet stream, which conceptually can be thought of as the "highway" for storm systems. The storm will lose forcing as it travels up the coast (and moves from mature to decay phase) but there will be plenty of drought denting rain for the region. Some light rain showers will break out in the pre-dawn hours. Here is the simulated radar from 9 AM Tuesday until 9 AM Wednesday at 3-hour intervals. The steadiest rain will fall after 3 PM tomorrow. Temperatures will only max in the mid to upper 40's for some of the region. Others will get into the low 50's but with the wind out of the east, it will feel raw. That east wind will also allow for some water rises along the east and south facing beaches. Overall, coastal flooding will be minor. However, the tides are already astronomically high so the introduction of an ocean storm will create a few headaches. Winds will gust 30-40 MPH for much of New England on Tuesday afternoon and evening. Winds will approach 45-55 MPH in SE MA Wednesday as the low tracks slowly North. Temperatures won't fall much tomorrow night but the rain will linger into Wednesday AM. 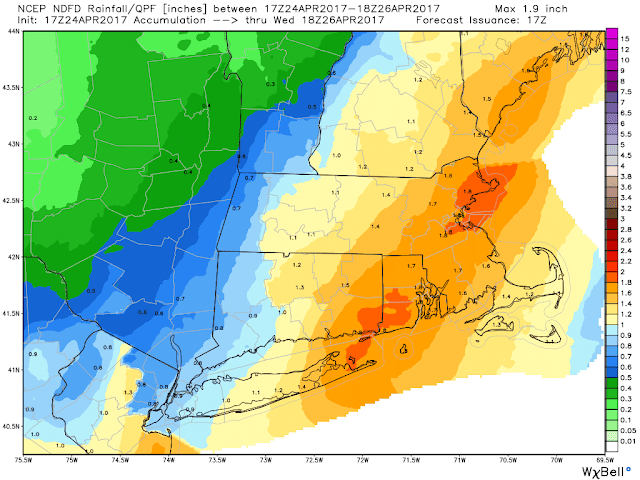 Total rain will be over 1" for most east of the Connecticut River. Although it has been dry the past week or so there is a low chance of flash flooding tomorrow, according to the Weather Prediction Center (WPC). Temperatures will be near 60 on Wednesday before getting back into the 70's on Thursday, Friday, and Saturday. 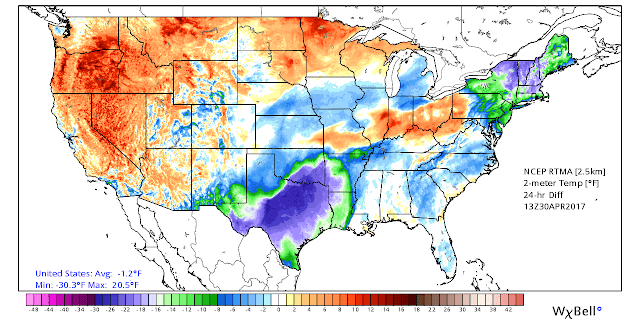 In the meteorological world, we are now halfway through spring. We know that's not exactly true in Southern New England, but June is now the same distance in front of the hood as February is in the rearview. Easter/Passover weekend marks a Spring landmark for many and it looks as if Mother Nature will cooperate this year. Above normal temperatures and mainly dry weather is in the forecast. Dry with temperatures running in the low 60's today. The National Weather Service (NWS) is noting the potential danger fire poses today. High pressure is control over the northeast. A few high clouds will be possible midday as an upper-level disturbance quietly tracks through the area. Tonight winds will still have a northerly component so temperatures will drop into the 20's in Northern New England. 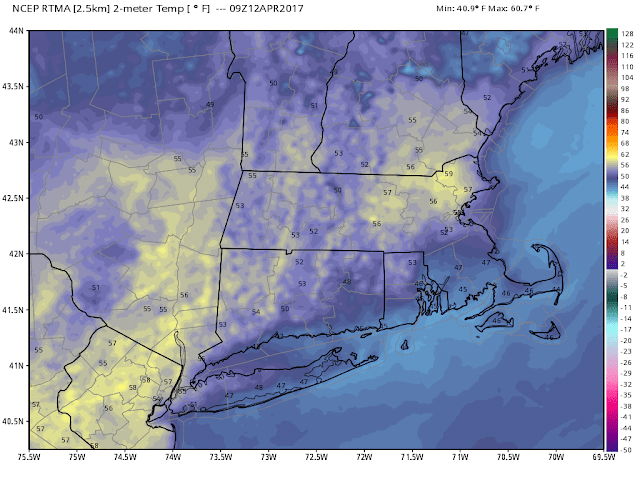 After midnight the winds will go calm and with clear skies, temperatures will drop into the low to mid 30's in Central/Western MA. On Saturday a warm front will advance north and east. This will increase temperatures and clouds tomorrow. Temperatures will rise into the mid to upper 60's. There will also be a threat of rain showers Saturday evening. Many churches have outdoor bonfires for the Easter Vigil so we will have to watch out for that. Here is the 8 PM simulated radar. This has some returns, but it is very light across Worcester County and Eastern Massachusetts. The rain threat is between say 5 PM and 11 PM. The good news is this will put SNE in the warm sector for Easter Sunday. Early morning church service or Easter Egg hunt? You probably don't even need a jacket. Morning lows are in the low 50's. It's nice being in the warm sector. Winds will be out of the southwest will be breezy, with gusts of 25-30 mph possible. Max temperatures will be in the low to mid-80's! I'm sure runners wish it would be a bit cooler, but Monday will be very nice with max temperatures in the upper 60's/low 70's. 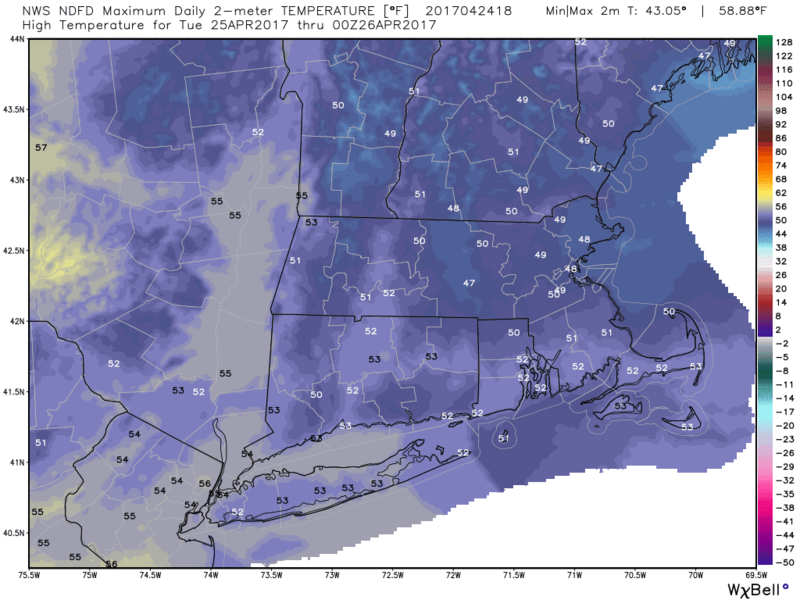 AM lows will only drop into the mid 50's. I suppose it could be worse; the marathon could be on Sunday. Expect mostly sunny skies. Have a great weekend, religious or otherwise. If I were a high school athletic director, I would hold off on canceling any games or practices this afternoon until I saw the actual radar around noontime. 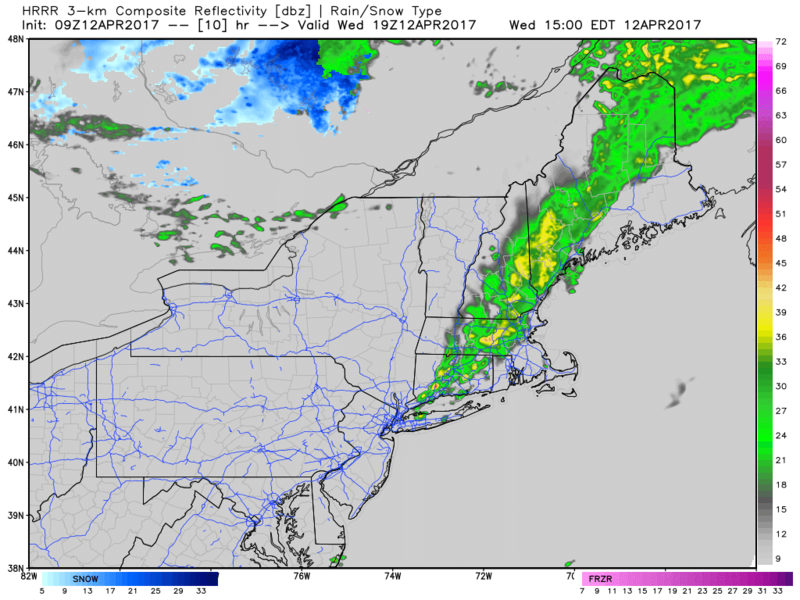 A cold front will slowly cross Southern New England bringing increased cloudiness and a good chance of showers and thunderstorms after noontime. Temperatures will be around 70 pre-FROPA (frontal passage) before falling steadily into the 30's tonight. Warmth will return by the weekend. I kept my windows open last night as temperatures only fell into the mid 50's. As of 5 AM, most of interior Massachusetts was already approaching 60. The South Coast, Cape, and Islands are all in the mid 40's. There is some sun right now but that will change. A bank of clouds is just to our west and this will progress east with time. 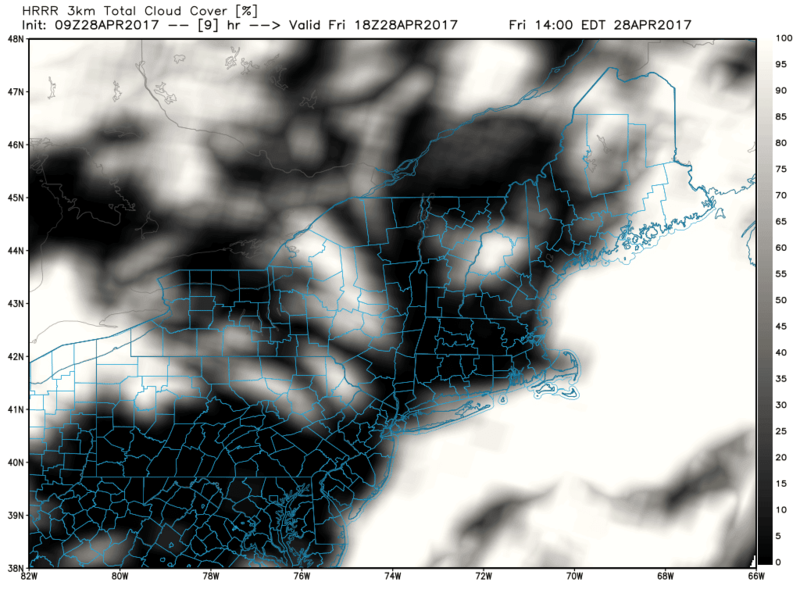 For Central MA expect increasing clouds after 10 AM. Temperatures will steadily climb into the low 70's east of the front today. That would include all of MA except the Berkshires and Cape as well as all of CT and RI. Unlike yesterday, we won't smash record high-temperature records but this is a solid 10-15 degrees above average. 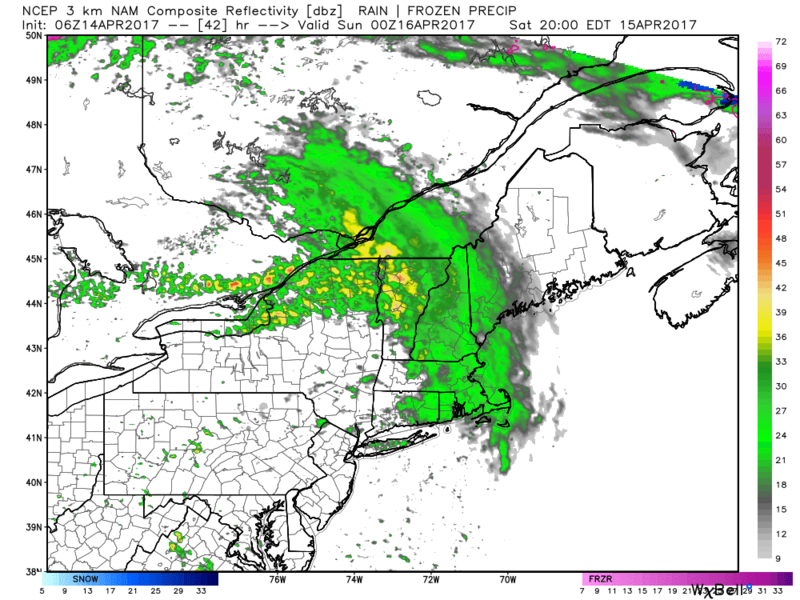 Here is the simulated radar images for 1, 3, and 5 PM today. We aren't looking at much rain with these showers. The one problem would be an isolated lightning strike. But the downpours should not create many puddles on the fields so my professional opinion is to keep plans, just be aware there may be a brief delay. Temps will slowly fall after the rain ends. It will be in the upper 40's by 9 PM and the upper 30's/low 40's by 5 AM. The cold front is well offshore by tomorrow morning and a cooler NW wind that sticks around into Saturday. By "cooler" I mean high temps in the low 60's, which to me is incredibly pleasant. The wind will be 10-15 MPH. The next weather maker is just entering the Pacific NW now. It will move across the country, perhaps delivering some rain Saturday night. However, that rain will be associated with a warm front so by Easter we will be in the "Warm Sector". Max temperatures will be in the mid to upper 70's (even a few 80's likely). Conditions for the runners on Monday look swell, right around 60 with partly cloudy skies. Jeans and sweatshirts for the fans, comfortable running conditions for the competitors.